When you find a jewelry designer who uses raw materials to create a streamline of industrial accessories and believes in ethical consumerism - there's no question, we had to find out more! Getting to know Heather Sheppard, owner and designer of Knots and Pipes, we realized there was more to her jewelry line than just style. Sheppard has taken the industrial look and blended it with a minimalist design that has made a major influence on her line being noticed and loved. Affordable and adored, Knots and Pipes is growing everyday and we couldn't be happier for her. Entire Magazine: How did you first start on your path? Knots and Pipes: I started on my path of really creating when I was 7 and my grandmother taught me how to crochet. I practised the single stitch until I could do it with my eyes closed. Sewing came next, after spending countless hours crafting with discontinued leather samples at my family's small, independent furniture store in South Western Ontario. Fast forward twenty years; I was living in Toronto and having a hard time finding statement accessories with clean lines made from raw materials. Made in Canada was important to me and it was near impossible to source pieces with the aesthetic I was after at an accessible price point. Introducing Knots and Pipes. At first I made pieces of jewellery for myself, friends and family. After some encouragement from loved ones (and a much needed creative outlet from my full-time day job), I purchased the domain name- website launch coming this year. Next I set up an Etsy site and began to document my design process via instagram. As they say, the rest is history. EM: How did you come up with the name Knots and Pipes for your line? KP: The name pays homage to my initial design process (which, to be honest, has not wavered far over the past two years). "Knots" represents the sewing, crocheting and leather knotting involved in many of my pieces. "Pipes" is a nod to my extended family's blue collar roots in South Western Ontario. Small mechanics, millwrights and welders; during my childhood I was surrounded by an array of tools, raw metals and people who maintained a strong "do-it-yourself" mentality. These factors have undoubtedly influenced my design process-many of my pieces contain copper, brass piping and repurposed leather and beading. EM: What does industrial jewelry mean exactly and what is your inspiration? KP: I cannot speak for the official dictionary definition, (if there even is one) but my definition would be streamlined, (often minimalist) jewellery made from raw materials. If I were to dive deeper into what this term represents for me, I would say small batch production using materials that are locally sourced whenever possible. It's a nod to the ateliers, cobblers, tanners and mechanics who have mastered the use of these materials in their craft. While many of the tassel earrings in my collection do not contain leather or copper piping, the small batch production process and overall slow fashion mantra is upheld across the board in my studio. While I raised in small town Ontario, after living in the Junction, Toronto and downtown Hamilton my style has been heavily influenced by the industrial roots of these neighbourhoods. I am inspired by the concept of purchasing less but choosing well (and maintaining one's purchases for a long period of time). That is what I hope to encourage among people who visit my shop; I stand behind my pieces and hope to help people see the importance of product maintenance. Utilize your cobbler, get to know an expert tailor in your neighbourhood and think twice before buying pieces of unsustainable fast fashion. Specifically to my pieces- clean the copper piping using the included cleaning cloth, store in the drawstring pouch and contact me directly if these are any issues with clasps, etc. EM: What’s the process of finding your own inspiration or the inspiration of the line? KP: My process involves extensive antiquing and thrifting. I also find a significant amount of inspiration by visiting the long-established fabric districts in large cities. I could spend entire days (and have) walking through Hamilton's Ottawa Street North and Toronto's Queen West fabric districts. Multi-generational hardware stores, estate sales and the minimalist fashion movement in general also contribute to my design inspiration. When it comes to sourcing materials, I let what I find inspire me. A majority of my pieces come from stumbling upon an incredible vintage necklace or copper pipe and the inspiration for design unfolds from there. This summer the inspiration for a lot of my statement tassel earrings was derived from the minimalist fashion movement. I think it is safe to say that elaborate, ornate statement earrings are on trend here in North America. That said, the idea of pairing a plain t-shirt dress with statement earrings still struck a "minimalist" chord in me. That gets me excited. EM: The pressure on a new business or goal can be heavy, what have you done to help your brand grow and help in funding? KP: That's a great question. My brand's growth has occurred organically; through word of mouth, repeat customers and individuals who are committed to paying a little more for a handcrafted piece, with the knowledge that it was locally made by someone who is willing to stand behind their product. I am hyper aware that one can purchase a pair of statement earrings at a fast fashion outlet for a fraction of my price. I am simultaneously aware that more and more people want to know who made their accessories, under what condition and how they can maintain them in order to last far more than one season. Regarding my business journey so far, it has certainly had its ups and downs. I have learned that creativity and perfecting my craft is only part of the process.Marketing, a business sense, supply management- these are all things that I had to learn (am still learning) along the way. I underestimated these components in the beginning but am starting to get into the groove of managing both aspects simultaneously. EM: What are some of your favorite pieces from your line? 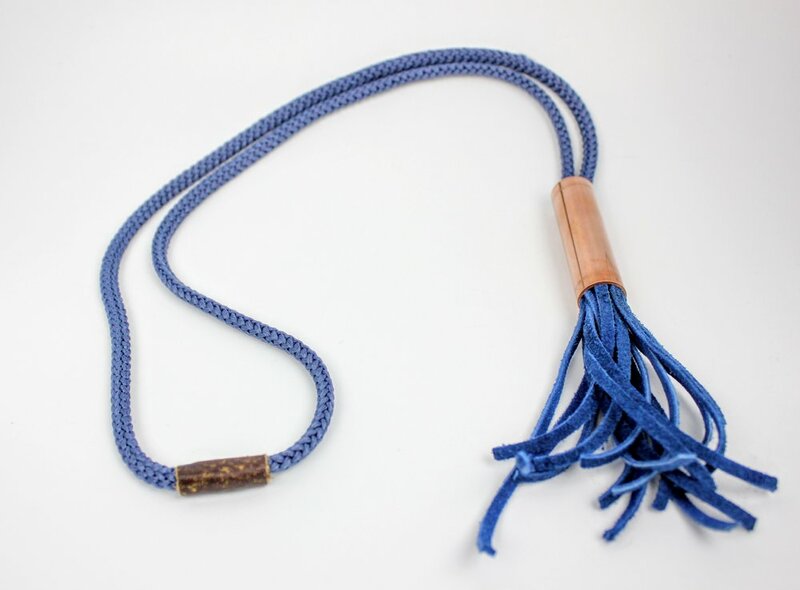 KP: I would say this changes on a regular basis, however I am currently loving the sage green tassel earrings, the cobalt blue copper necklace and the tiered copper cotton/linen necklace. These pieces are on rotation in my fall wardrobe and represent the various design waves I have found myself going through.